Following my PMP post, here's the review of the second gadget I bought this holiday season, the Flip. 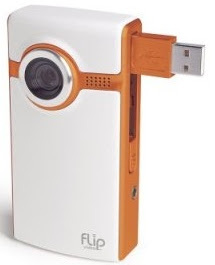 The Flip is a simple video camera for people who can't operate a video camera. If you just want a casual short video of the family, or a location, and you don't overly care about image quality, the Flip is for you. With just one button to start/stop recording, auto-focus and internal memory, the Flip is ideal for people who are less technologically savvy (e.g. my parent - the recipients of this gift). The Flip, like all cameras, has 2 modes: Record and Play. In Record mode, just hit the big red button, point at the subject and hold your hand still. The Flip fits comfortably into the palm of your hand and the small 1.5" screen makes it easy to align your shot. The up-down arrows allow you to use a 3X digital zoom. But still, the Flip is much better for closer subjects, not wide backgrounds. Click the red button again to stop recording. The Play button allows you to play the clips. Use the arrows to skip to the next/previous clip, or the Trash Can button to delete a clip. You can either play the clips on the small screen, or connect it to any TV (Flip-to-RCA cable included). Every operation on the Flip is accompanied with a visual and audio cue. When in Record mode, the timer on the screen switches to red, and a light turns on in the front of the camera - so it's easy to know if you're filming or being filmed. 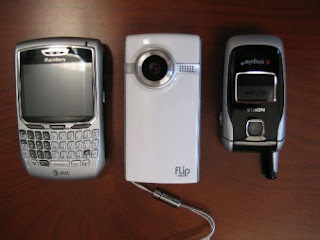 The Flip has an internal memory store, good for 60 minutes of video. No memory card is available (although I've seen a hack online where someone opened it and doubled that time by using a flash card). When it comes time to download the clips to your computer, you'll find an extending USB arm (which lends the Flip it's name). Connect it to your computer and either use the software (conveniently hosted on the internal disk of the Flip, so you can use it on multiple computers), or use Windows Explorer to browse to the files on the camera itself (appears as a Removable Storage device under explorer). 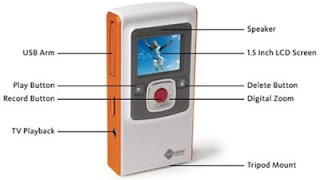 The Flip shoots VGA videos (640 x 480 at 30 frames per second). Files are compressed into MP4 videos (.avi extension) and are playable with any media player. It has a 2GB internal flash memory, good for 60 minutes. It operates off 2 AA batteries, which would carry you for 6.5 hours. You can use rechargeable batteries, or carry extra batteries with you. The Flip connects to the computer through a USB 2.0 link (supports 1.1, as I've seen with my parents old computer - although transfer time is noticeably longer). The Flip's software resides on the Flip itself, and will auto start as you plug it in (if autostart is turned off, as was the case in my computer, just browse to the disk and double-click the icon). The Flip's software allows you to manage the Flip's memory, archive files, send clips using email (in which case it compresses them further, at the expense of quality), or share them online (upload to YouTube etc.). It also allows you to edit the clips and add some effects. It doesn't rival video editing suites, but it fits the spirit of the camera (simple interface, big colorful buttons). When I used my Flip the first time on my laptop, it had some problems in synchronizing the clips and lost connection several times. It turned out this is a known issue and a patch to the software exists on the company's site. As soon as I connected the Flip to a computer connected to the internet, it patched itself (the firmware, software, and it even re-encoded all the movies in memory). Total patch time: 15 minutes. After the patch, operation is smooth and I wouldn't have written this review without it. Transfer time is still a bit slow. No software exists for the Mac, which is a big minus for me (although my parents could care less ). The company promises a version would be available on January '08. The location and shape of the USB plug can also be uncomfortable (think about crawling behind a desktop and hanging your camera from the plug). I recommend getting a USB extension cord ($3-5). Despite it's "young" and "cool" attitude, it still feels a bit plasticky to me. The Flip is compact and easy to use and serves it's purpose. For it's price range it delivers what it promises: simple video shooting, easy transfer and sharing. Ideal for casual video capture and for people who are intimidated by more complex cameras. The Flip is available in various colors and in 2 configurations Flip (30 minutes) and Flip Ultra (60 minutes) which was the one I've used for this review. It'd set you back either $100 (Flip) or $150 (Ultra). I give it 4/5 stars. Get it here. It now comes with Mac software, but it's garbage. It distorts and looks lousy. The YouTube utility is absolutely dreadful. If you have a Mac, odds are you have iMovie. iMovie imports and the videos look awesome. Use iMovie. Don't use anything else.